Bomb Girls is back. For me, much of the show’s interest lies in its portrayal of women’s wartime fashions, both on and off the factory floor. One line of sewing patterns that I associate specifically with the Second World War is Weldons So-Easy patterns. 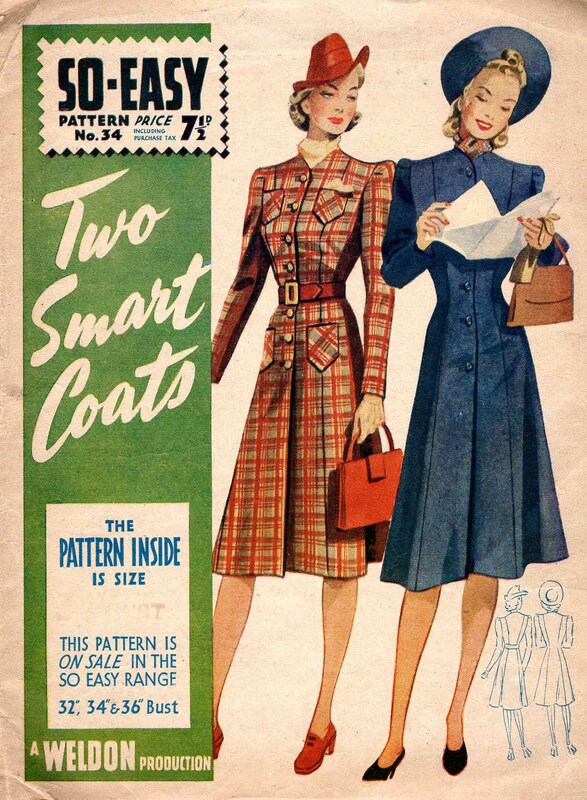 Weldons So-Easy 34 (c. 1940) Two smart coats. Image: Vera Venus. So-Easy patterns don’t bear copyright dates, but some include the war rationing notice, “Professional dressmakers are reminded that they must comply with the Making of Civilian Clothing (Restriction) Orders.” These measures were passed in 1942-43. (For the text and discussion see Cargo Cult Craft’s posts.) According to U.K. vintage dealer Tracy of Wickedlady Collectables, Weldons did not promote So-Easy patterns in their magazine, but the mention of purchase tax, introduced in late 1940, can also help with dating. One thing that distinguishes wartime So-Easy patterns is their pinup-style illustrations straight out of Mrs Henderson Presents. 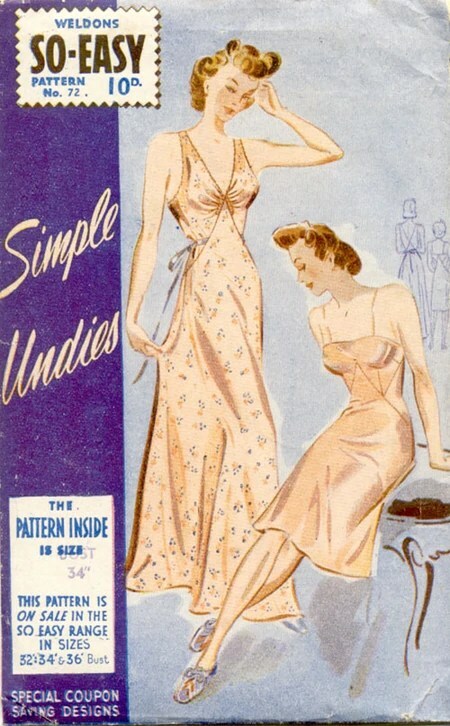 Here is a selection of World War 2 Weldons So-Easy patterns, with an emphasis on lingerie. Weldons So-Easy 50 (c. 1942) Pretty undies. Image: Vintage British Style. 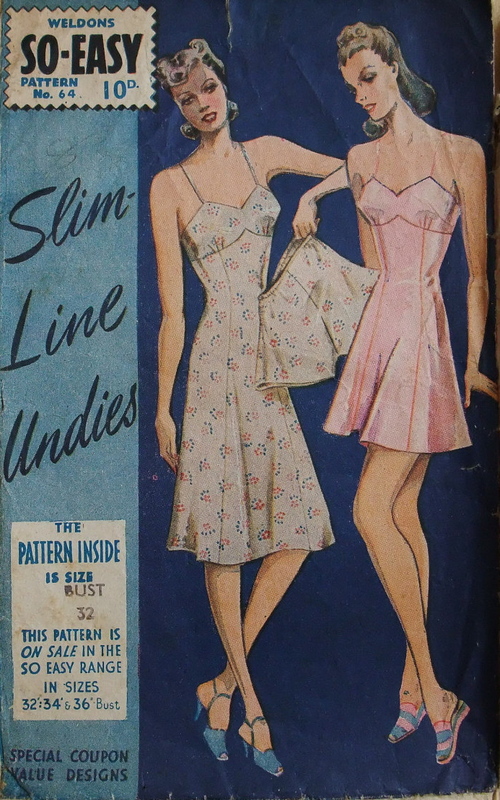 Weldons So-Easy 64 (c. 1942) Slim-line undies. Image: eBay. Weldons So-Easy 72 (c. 1942) Simple undies. Image: Vintage Patterns Wiki. 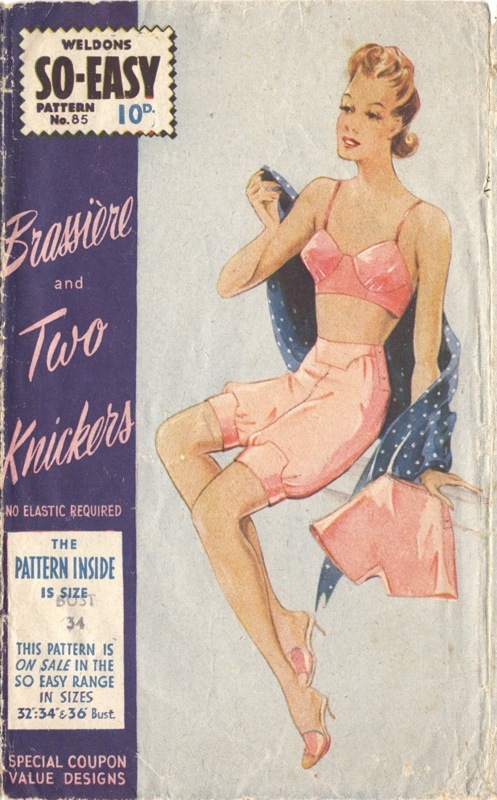 Weldons So-Easy 85 (c. 1942) Brassière and two knickers. 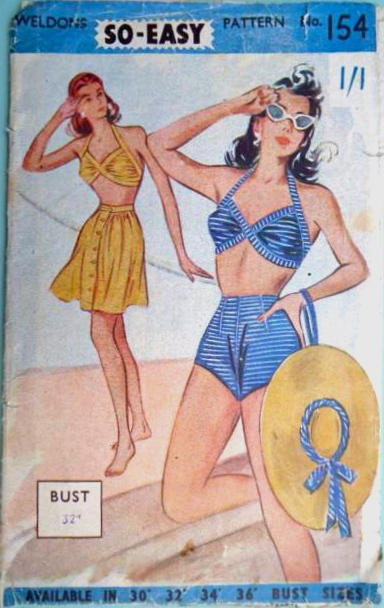 Weldons So-Easy 154 (c. 1943) Two-piece bathing suit and skirt. Image: eBay. Weldons So-Easy 19 (c. 1940) Two-way siren suit. Image: Vintage Patterns Wiki. For fans of Bomb Girls, which films in the Toronto area, it’s possible to visit some of the locations for the show. Victory Munitions and other sets were built in an old furniture factory in Etobicoke, while street scenes were shot in Hamilton. The Witham mansion is Oshawa’s Parkwood estate, the former home of General Motors founder R.S. McLaughlin. Wonderful undies patterns! True treasure. I love that plaid coat and the slip in the “Simple Undies” pattern.